Want to become a physics teacher? A new program at SF State is aimed at helping you reach that goal. The B.S. in Physics: Concentration in Physics for Teaching, added to the curriculum for fall 2013, is designed to give students a solid foundation in physics plus the teaching skills and broader knowledge that will help them succeed as educators. SF State physics students Jordan Jo, from left, Jessica Vargas and Christian Engelbrecht are hoping to become physics teachers. A new concentration in the physics department designed to help them and others who aspire to become educators. Professor of Physics & Astronomy Adrienne Cool, who designed the new program, said its creation also sends a message of encouragement to students considering teaching. "We want students to know that the department values teaching as a career choice," she said, adding that there has been a "small but steady stream" of students each year interested in becoming science teachers. The Physics & Astronomy Department previously directed such students to its B.A. in Physics, but Cool said that program was not designed specifically for aspiring educators and that the career path in general lacked visibility within the department. The new concentration represents a more proactive effort to identify potential future teachers and provide them with the specific knowledge, skills and resources they need to be successful following graduation. In addition to the physics courses offered in the B.A. program, the new concentration includes a course that will give students real-world experience in San Francisco classrooms. The concentration also requires students to take several classes in another academic subject -- chemistry, mathematics or general science -- to broaden their knowledge and make them more attractive job candidates. "Not many high schools offer large numbers of physics classes," Cool said. "If you want to get hired, you need to be prepared to teach another subject. Schools need science teachers with some versatility." The concentration will also allow the department to identify aspiring teachers earlier and steer them toward the resources, support, and funding opportunities provided by the Teacher Fellow program run by SF State's Center for Science and Mathematics Education. "In the past, students interested in teaching could fall through the cracks," Cool said. "They would miss out on funding opportunities and on interacting with other students pursuing careers in teaching. We want students to explore their career options while they're still at SF State and discover if teaching is something that excites them." For more information about the B.S. 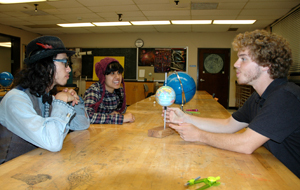 in Physics: Concentration in Physics for Teaching, visit http://www.physics.sfsu.edu/Academics/Undergrads.html#bsteach.